Angry manager: “YOU CAN HAVE ONE OF THOSE THINGS!” Walks away hurriedly. Starling: Stops browsing the free health hand-out she was looking at. Only then realizes there is a counter of free stuff in front of her. 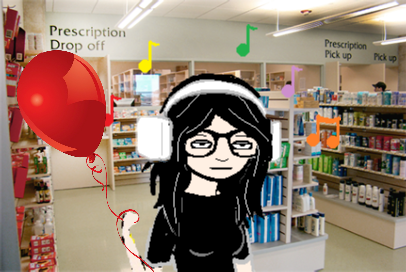 She frowns at retreating no-fun-manager, and then turns to table, eyes lingering on the balloons that are not part of the giveaway, but the display. Master Betty: “No…it wasn’t ever a thing. You can’t bring it back.” Sighs and demands to leave as Starling eyes angry manager and begins to conclude that angry manager must be a stressed manager who may need some meds.